No, Edna isn't here yet. No. I'm not in labor. No. I'm not sure when she'll get here. Yes, I'm tired. Yes, I'm ready for her to come. But here we are. In the waiting room. Edna and I. Flipping through Facebook like last month's issue of Cosmo. Flipping back and forth on the bed all night like sausages in a frying pan. I feel like I should be cooked through by now. I make frequent visits to the restroom and have to sit down frequently after small bursts of menial labor- dish doing and floor sweeping. I picture Edna crawling around in fleece pajamas in six months and how she'll be covered in cat hair and dog hair. All the little clothes have been cleaned and sorted. There's a bag packed with comfortable pajamas and warm socks and clothes I wore before Edna existed months and months and months ago. Brad gave me permission to have the baby as of 2:44 this afternoon. That important meeting he had at work today - the "very business-y business meeting" with "very important corporate-is things happening. Agendas and goals and such" wrapped up. "Other dependencies have been addressed" so he says, "we can move forward to prioritize baby birth in the upcoming sprint." We've been addressing dependencies for the past six months it seems. House hunting and buying and packing and unpacking. Minivan buying. Cradle building and carseat installing. All wedged into the life we were already living: School, work, soccer, musical theater, doctor's appointments, swim practice, trips to the vet, birthday parties and visits with family. Etc., etc., etc. The squares of the calendar– which for months had been filled with stuff now yawn wide- a flat open vista as far as the eye can see. Back in May I looked at those blank spaces like an oasis. The place I'd catch my breath before the next marathon. But this giant baby is pressing against my lungs (and bladder and pancreas and ribs) and that deep breath feels impossible. The still days feel more like a sentence than a gift. I am frustrated by my own fickleness and impatience. My unwillingness to accept that which I have no control over. My anxiety about the future when really, truly I know the only thing I need to focus on is the perfect present and the fact that I made it here to the waiting room, finally. And that everything is more or less in order. All those massive uncertainties, those giant worries whittled away. That we got to this moment where the checklist is all checked off. This week, I think I need to reimagine my waiting room. It doesn't have to look like purgatory or the line at the DMV or the doctor's office with all its sentimental photos of other people's babies. It can look like the beautiful home we'll bring Edna home to. The rocking chair in living room where I can look at photos of the girls in their babyhood and my favorite knickknacks. The shaded deck with all my wind chimes where we can all sit and giggle as we watch a squirrel leap back and forth between trees like a ninja warrior. The front stoop where I chat with neighbors or sit on as the girls ride back and forth, back and forth on the two wheelers there were convinced just months ago would be impossible to master. That crape myrtle I pass on walks with the dog where the same songbird sings and sings and sings each morning and the garden I pass on the way to the pool where tiny roses in all colors bloom like confetti. Today the open space across the street was electric with dragonflies. Hundreds of them zooming here and there and back again. 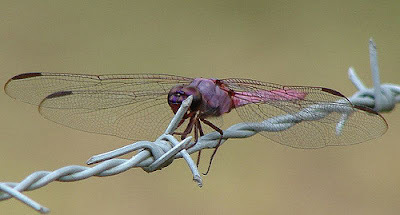 Since I was young, dragonflies have always been magic to me and I feel magic in the air. They are symbols of transformation and lightness and joy. Change is coming. It's in the air. Yes, Edna is coming soon. Yes, at this minute, I think I might be the luckiest person I know.